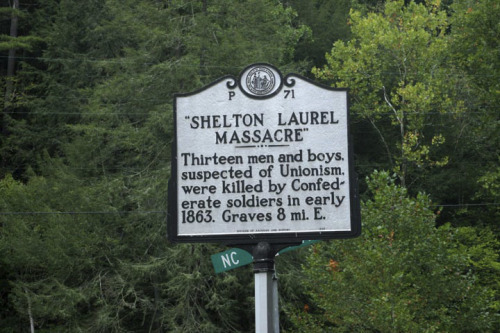 Madison County, North Carolina, earned the moniker Bloody Madison in the Civil War, specifically in January 1863, at the well documented, and well remembered, Shelton Laurel Massacre. That terrible and fearful time in our county’s personal past is thankfully long gone. The nickname, however, has stayed with us and some people would say for good reason. I don’t know if we have more violence and mayhem in Madison than other places of comparable size and demographics, but we certainly have our fair share. Here are a few notable instances from years past. The year before I moved here, 1972, Nancy Morgan, a young VISTA worker, was murdered and left hogtied in her car on Hot Springs Mountain – a case that remains officially unsolved. Five years later, Philip Turpin and Lorenzo Crews murdered two Yancey County men passing through the county on their way to Greenville, Tennessee. The bodies were found some weeks later in an abandoned stone quarry on Highway 208 after the murderers were overheard bragging in a Cripple Creek, Colorado bar about “getting away with murder in North Carolina.” Then there were the elderly Gahagan siblings who were killed in their home near the Belva community and the man who murdered his daughter by feeding her food laced with pesticides. And one only has to look at the weekly arrest report in the newspaper to realize there are people living here, as there are everywhere, who believe violence is the answer to their problems. Wildness and isolation tend to be defining elements for much of Madison County and I think people, non-residents especially, associate those characteristics with the idea of Bloody Madison - a place where people tend to deal with their own problems. 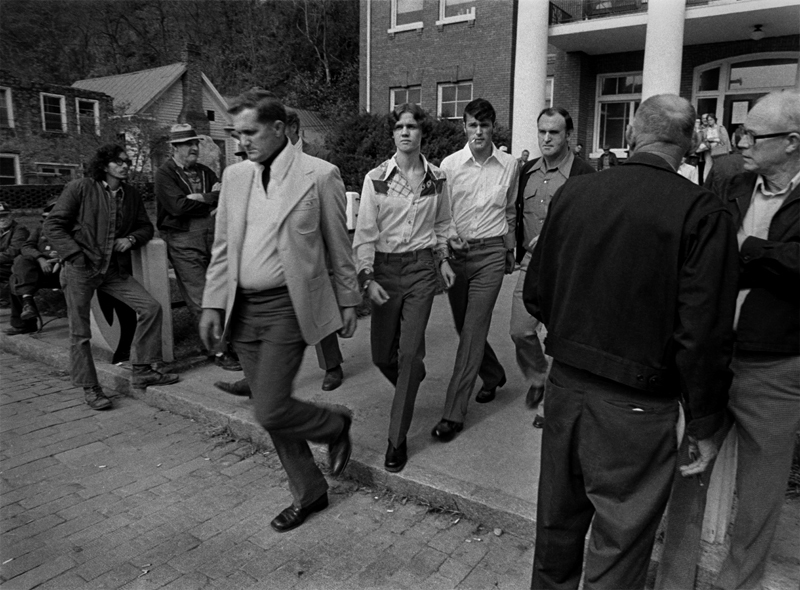 Madison County Courthouse to the jail, Marshall, 1978. There has been a concerted effort over the last fifteen years to temper the county’s image and it has since been reborn as The Jewel of the Blue Ridge. This extreme makeover corresponds with the construction and opening of I-26 and efforts to make the county more appealing to developers, small businesses, and new residents; a program that was largely successful until the economic collapse of 2008 altered the dynamic. Since then, most new, gated communities have gone belly up and the initial flood of new people has slowed. One has to wonder if those developers, as they ponder their red-inked balance sheets, or the county itself, as we mourn our bloodied landscape and lost tax revenues, still think of Madison as a jewel. 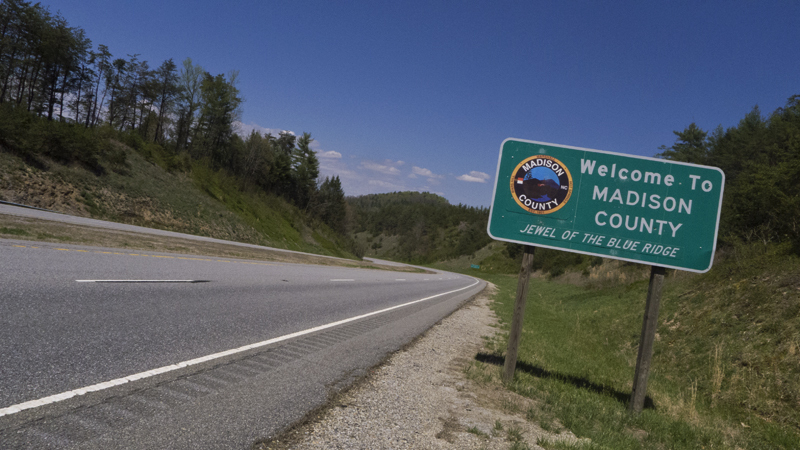 It’s not that I dislike the name, The Jewel of the Blue Ridge, or what it represents. I know I live in a jewel of a place - safe and comfortable, with generous, welcoming people. But I also know this can be a hard place to live and that it’s not for everyone. A jewel connotes a certain ease, a station in life, that doesn’t quite mesh with our sometimes hardscrabble reality in Madison County. But Bloody Madison continues to ring true for me - not the mayhem and violence associated with it, but the name itself. It’s a name with guts and character. For me, it speaks of wildness, and isolation, and a certain unknown, or unmapped, quality. We live in an environment where the natural world plays an influential role in our daily lives. Those influences – the air, water, and soil, the quiet, the mountains and forests, and the culture itself – are the Jewel we speak of. They are our reasons for being here. But without care, attention, and an openness to change, or simply because the world can be brutally unforgiving, as it was in 1863, that jewel can be tarnished and dulled, and oftentimes is Bloody. Victims, Phillip Paludan. An excellent book on the Shelton Laurel Massacre. The Kingdom of Madison, Manley Wade Wellman. Popular history of Madison County. Mystical Madison - The History of a Mountain Region, Milton Ready. A new non-academic history by Professor Emeritus at UNCA.